Identification: Small—1.6". Almost never seen with wings open. Below: FW and HW brown, with two faint eyespots on the FW and several prominent, yellow-ringed, asymmetrical eyespots on the HW. 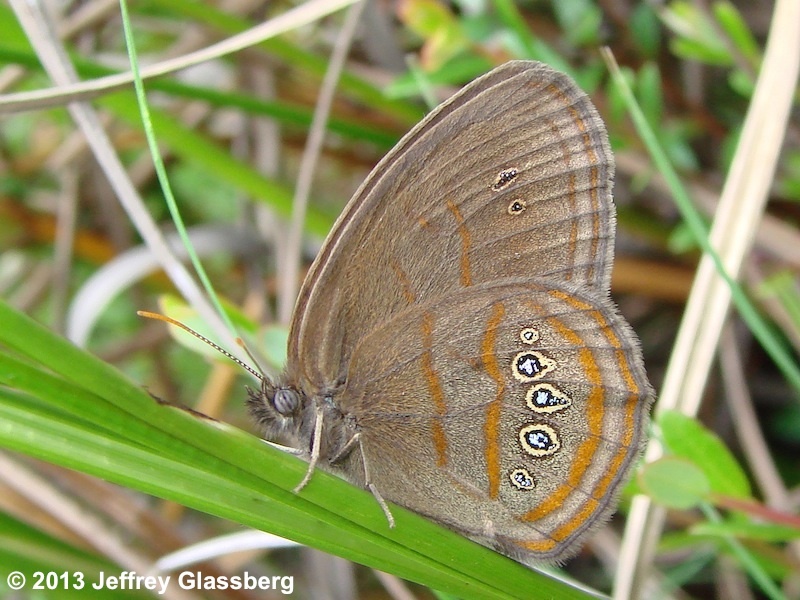 The HW eyespots are enclosed within a rust-colored line forming an oval. NJ Status and Distribution: Resident. Classified as Special Concern in NJ. Rare and local. 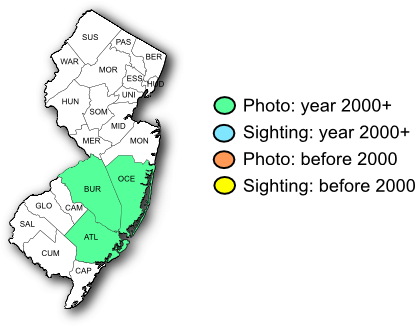 The pine barrens in Ocean and Burlington counties represent the northern range limit of this southern species. Habitat: Herbaceous wetlands dominated by grasses and sedges. Flight Period: Usually only one brood that flies from late June to mid-July but in some years (i.e. 2016) there are two broods--the second from August into September. Extreme dates: 6/17—9/2. Larval Food Plants: Probably wetland sedges. Comments: Special effort must be made to see this beauty of our pine-barrens bogs. The few known locations of this species probably reflect lack of searching in abandoned cranberry bogs. Lakehurst Bog, Ocean Co., NJ, 06/17/10.